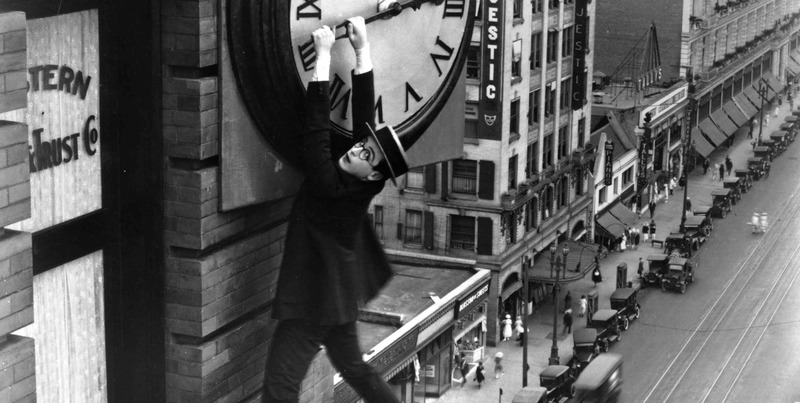 One of cinema’s most enduring and iconic images is Harold Lloyd, donning his trademark boater and circular spectacles, hanging precariously from a clock face above bustling streets below. In this timely snapshot we can see the silent era’s greatest strengths: absurdity, comedy and physicality. While trying dramas such as Birth of a Nation (1915), Sunrise (1927) and The Passion of Joan of Arc (1928) elevated the critical and commercial appeal of the newly realised medium, it was comedy that quietly shined brightest on silver screen. It seems only natural that comedy would be the genre that defined cinema’s nascent appeal. Commercial cinema began its life in the vaudevillian theatres that dominated mass entertainment at the turn of the 20th century. Films, often as short as 30 seconds, were originally shown between the variety showcases that defined vaudeville and music hall entertainment. Motion pictures were an entertaining side note to the ever-changing routines at these venues: singing, dancing, comedy, acrobatics, minstrel shows, trained animals and everything in-between. It was in these short, sharp showcases that the imminent stars of comedy made their name and honed their skills. Fatty Arbuckle, Buster Keaton, Stan Laurel, Ben Turpin, Harry Langdon, and of course, Charlie Chaplin, all successfully transferred their vaudevillian experiences into motion pictures. Yet rather than just replicate their stage routines onscreen, these future household stars used the new medium’s unique elements—editing time and space—to push the boundaries of entertainment. As films grew in stature and popularity, propelled by the emergence of nickelodeon theaters and deluxe picture houses solely designed to show movies, the popularity of vaudeville and variety acts waned. But instead of fading into a few lines of a history book, vaudeville’s unique brand of sketch-based entertainment evolved into and defined one of film’s most prominent periods. Vaudeville’s fragmented nature and near bottomless supply of talent meant that shows rarely featured any connective narrative thread. Film followed suit by heavily focusing on set pieces instead of expansive stories. It was actor/director Mack Sennett, often labelled the ‘King of Comedy’ and innovator of slapstick cinema, who took the vaudevillian ideals and projected them on to a moving image. With his Keystone Studios, Sennett championed physical comedy with narratives as merely vehicles to concoct absurd and hilarious scenarios. Sennett’s most famous creation was the hapless band of policemen (known as the Keystone Cops) who never ceased to find themselves falling, spilling, crashing and generally destroying their way through the world. The classic double act fat and thin gag was one of Sennett’s favourites. It was most famously acted out by comedy duo Fatty Arbuckle and Charlie Chaplin in The Rounders (1914), and championed later by Laurel and Hardy. By dehumanising his characters, Sennett was able to throw them into walls, punch them, throw them off of buildings and use them as living rag dolls. Yet the great principle of slapstick remained: nobody ever got hurts no matter how deadly their injuries might have appeared. Sennett laid the ground work for popular comedies of the silent era, but it was starring actors like Buster Keaton and Harold Lloyd who took the baton and ran with it (only to run straight into a door, in all likelihood). An exception to the vaudevillian rule, Lloyd honed his skills in film shorts rather than on the stage like his peers. While his background differs, his performances have the hallmarks of a vaudevillian influence, making him a product of the same theatrical climate. Lloyd’s big moment came with the aforementioned clock face in Safety Last! (1923), a scene which typified his desire to thrill audiences at dizzying heights. In both High and Dizzy (1920) and Never Weaken (1921) Lloyd parodies the vertical growth of America by making the skyline his comic playground. Lloyd inverts his outward sensibility by being as clumsy and fallible as possible in a series of impressively athletic and ingenuous ploys of the Sennett pattern. In spite of these iconic moments, Lloyd’s comic contribution is often overlooked. When talkies emerged, many actors were able to lean on their stage and vaudeville experiences as a crutch. For example Roy Atwell, a vaudeville star, used his stage trained malapropism schtick as the voice of Doc in Disney’s Snow White and the Seven Dwarfs (1937). Lloyd had no such training, and without the tools to supplement his physical attributes, faded into obscurity without the grace with which he rose. 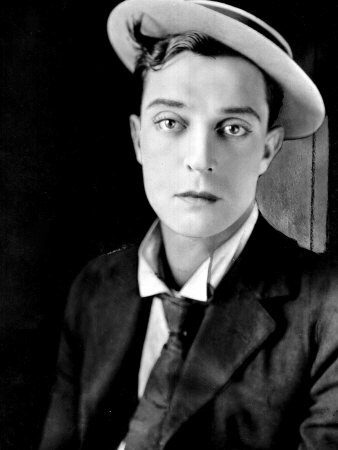 In a similar mould to Lloyd was the much-loved and revered Buster Keaton, perhaps the only real challenger to Chaplin’s throne as the king of silent comedy. Like Lloyd, Keaton relied on his athleticism to produce his most exhilarating and entertaining work. Standing at only 5’5” with bulging bug eyes and his trademark expressionless “Great Stone Face,” Keaton was the most unlikely looking of stars. He used his nimble frame and acrobatic training to his advantage by showcasing a breathtaking variety of stunts and falls. At times his leaps and pounds bear an uncanny resemblance to a side scrolling Super Mario game. Keaton’s formative years were spent touring the country with his family as part of the comedy troupe “The Three Keatons.” To avoid dulling audiences, and themselves, they would build their live act on the premise of improvisation. Keaton took this on-the-spot ethic that his formative vaudevillian years instilled with him into his films. To allow for off-the-cuff gags, Keaton would place the camera statically to frame an entire area; that way, the camera wouldn’t miss any unplanned inspiration. Where Keaton differed from Lloyd was in that his films possessed a narrative thrust and cinematic originality. In Sherlock Jr. (1924), for instance, Keaton literally dreams himself into the film he’s watching. All of a sudden Keaton is careering across the screen as the environments shift seamlessly between desert, mountain and oceans. Not content with just rehashing his stage work on screen, Keaton was alive to cinema’s intrinsic properties. This moment in Sherlock Jr. is a fine example of the early possibilities of film’s ability to shift time and space without so much as a flicker. Keaton’s eye for innovative editing prove his value as more than just a performer; indeed, his talents as a filmmaker earned him praise from critics like Roger Ebert decades later. As Keaton bounced and bumbled his way through cinema, it was Charlie Chaplin who was giving it a sentimental heart. Not content with mere vaudeville-led slapstick laughs, an art he was honing as early as five years old on London’s stages, Chaplin pushed satire and story to the forefront of silent comedy. Chaplin was never overly fond of gratuitous slapstick and had greater ambitions to make an emotive connection with his audiences. His years on the stage working under Fred Karno and American actor manager William Gillette taught him more nuanced acting techniques which heavily influenced his landmark films. Chaplin’s alter ego, “The Tramp,” proved to be the perfect blend of comic appeal and poignant sadness he was looking for. The character was also the perfect vehicle for him to scrutinise the modern capitalist world. The Gold Rush, City Lights and Modern Times all have narratives that concern alienation, greed and societal depravity—unusually heavy subject matter for typical vaudeville fare. The success of Chaplin came out of his ability to match iconic sketches with sharp social commentary. Scenes like the factory worker sliding through the factory’s cogs or the waif turning his boot into a gourmet dinner are just two of those superb moments. While some of Chaplin’s greatest films were produced in the talkie era, their execution is always founded on the laws of silent cinema. Chaplin’s comedy may not have the visceral impact of his peers, but his routines were concocted with an intelligence, timing and deftness that were untouchable. Chaplin’s legacy and continued popularity was confirmed in 1972 when he received an honorary Academy Award and received a record breaking twelve minute standing ovation—not bad for a South London boy from a poverty stricken background. After the release of The Jazz Singer in 1927, the advent of talkies led to the dwindling popularity and success of silent comedy. For Chaplin, Keaton and their peers, sound’s arrival only muted their talents. Watching those silent comedies now is a staunch reminder of the innovation, artistry and innocence that remains as refreshing and impactful as it was 100 years ago. Humble vaudevillian beginnings lay the foundations for Sennett, Chaplin and Keaton to manipulate the moving image to create something truly unique to cinema. Film opened up a whole new world to these creative minds where anything was possible. It was a dreamlike realm where Chaplin could tug the world’s heartstrings, Keaton could leap off trains and Lloyd could swinging wildly from clock faces. When once a theatre’s capacity was the limit, it was soon the sky. Jonny writes for Movie Fail from England. A graduate of the University of Manchester, he also worked as assistant arts editor for film and television at The Massachusetts Daily Collegian. He runs The Latest Picture Show and is forging a career in film and pop culture journalism.